A native from Mexico. A very large, extremely graceful tree with strongly weeping, slender branches. Foliage turns orange-red in autumn. Very fast growth rate with regular moisture but slow under dry conditions. 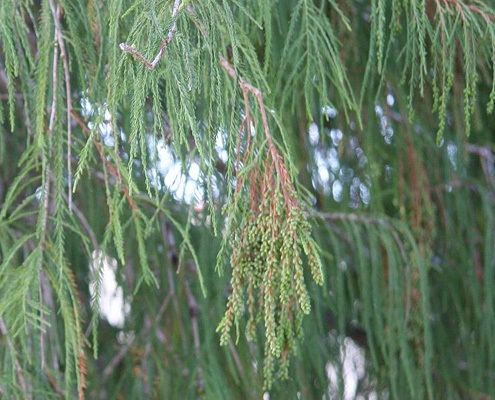 Montezuma Cypress holds its foliage longer than Bald Cypress and is somewhat tolerant of saline soil conditions. Evergreen in mild climates; partially or wholly deciduous in cold regions. 75' tall x 50' wide. Regular deep watering is needed for fast growth. An extremely large tree thats not recommended for residential areas.